Are you ready? 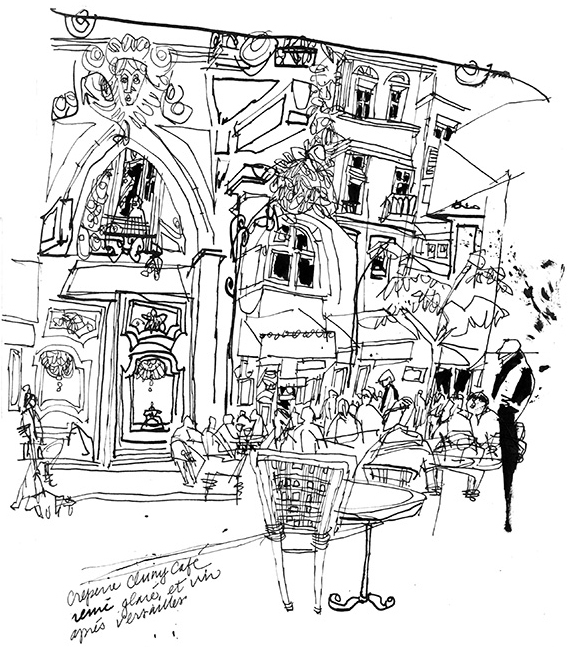 Pack your gear, your energy and your passion to embark on a three-day workshop of no-nonsense, informative urban sketching, in and around Prague. Join Veronica Lawlor and Melanie Reim, globally recognized illustrators, educators and drawing soldiers, as we navigate the people, places and things of this ornate and intriguing city. Leading the troops, Veronica and Melanie will talk about the hows and the whys of drawing on location, with demonstrations and hands-on instruction on site. Be in your best shape to draw though the day, through a series exercises carefully designed to build your drawing acumen, facility and ease of capturing the essence of where you are, who you see and how you feel about it. The workshop will kick off on the evening of July 19 with an image rich, illustrated conversation with Veronica and Melanie, showcasing their work and personal influences. The workshop will take place in and around the historic Old Town area of Prague- exact locations will be announced. Veronica and Melanie will present their urban sketching work, with some personal influences, together in an informal panel setting. Questions and participation encouraged! Pattern, texture and the combination and contrast of it all. It’s more than cross-hatching! Tips on how to capture gesture and movement; telling a story with your people. Final group critique and discussion of lessons learned. What you can use for your own urban sketching practice, moving forward. • A small stool for location, if you prefer. Contact Raj Dhawan at info@urbansketchers.cz for registration information, space availability, and payment details. 30 (minimum 20) All levels welcome. In the event of too few registrations, all monies will be refunded less PayPal fees. *Please note: cancellations up to May 1, 2019 will be refunded the full amount minus a cancellation fee of $35.00; 50% will be refunded if the cancellation occurs from May 2 - June 1, 2019; and no refunds will be granted after that date. Thank you for your understanding.